I remember when I first thought of myself as a runner. I was in first grade and our teacher told us that we were going to run a mile, and whoever finished first would get a prize. I remember feeling like I was weightless as I ran around the field, and was probably a little sassy as I finished well ahead of my classmates. After that, I would randomly run my neighborhood streets for fun, and by the end of my senior year of high school, I was running on our cross country team. I was never the best, mind you, but I loved to run. Fast forward to today, and I still love running, in fact, I would say I was born to run. And as our company’s wellness manager I get questions all the time about running: what shoes should I get, what race will help me get a PR, how can I run faster, or my favorite – I am just not made to run! And to that I say: we were born to run! One of my favorite running books, Born to Run, talks about how our ancestors would often times have to run for 26 miles (that’s a marathon) in order to wear down the zebra enough to catch it. So, in my book, if you lace up and run, even if it is a walk/run, or to the end of your street and back, you are a runner! It’s one of the most effective tools for weight loss. There are more workout programs out there than you can count, but ultimately running is one of the most efficient forms of exercise you can do. It isn’t perfect math, but the average person burns about 100 calories per mile walking and running. BUT it takes half the time to run the mile versus walk it. So if you run for 30 minutes and go 2.5 miles you will burn 250 calories versus walking 30 minutes and burning 150 calories. Those 100 calorie differences can add up to some major pounds lost over time! It is good for your heart. Your heart is a muscle. This is why exercise is so important for good heart health. Running is a great way to work out your heart and get the blood flowing through at a faster pace. Don’t believe me? Wear a heart rate monitor during a walk versus a run to see the difference. To get technical from my exercise lab days – running will help increase your VO2 Max (a measure of how effectively the volume of blood your heart is pumping through your body is) more than cycling or walking will. A recent study indicated that you can add up to three years of life expectancy just by running, or 7 hours for every hour that you run. And you don’t have to be a marathon runner to get these benefits, just running 2 hours a week can help you reap the benefits of a longer life and healthier heart. Not sure how to get started? One my favorite things about the sport of the run is that there is a club of people who will cheer you on and help you join the running tribe. Many local shoe stores (and breweries for that matter) host weekly running groups for all types of runners. 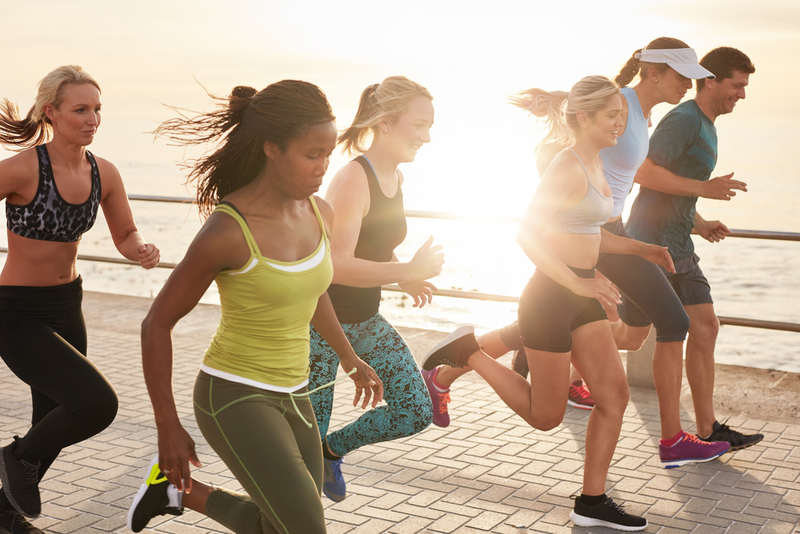 The added benefit is that shoes are the most important piece of equipment for a runner, so heading to one of these stores can help you get laced up in shoes that will help you be more comfortable on your run. Need a plan to get started? Check out my post on running an 8K in 8 weeks. Now I must warn you, running isn’t easy – there will be days you love it, and days that you hate it, and it does come with a little discomfort. But the benefits of a healthier heart and longer life are well worth the downsides.